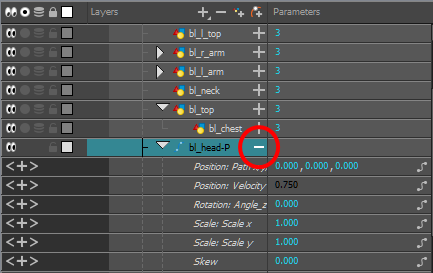 If there is a section of the animation that you want to reposition, such as the head's height or the puppet's position, you can do so using the function curve. In the Timeline view, click the Expand Function button of the body part layer to reposition. If you want to reposition the entire body, expand the master peg's parameters. Double-click on the layer's parameter controlling the keyframes you want to reposition. In the Function editor, select the keyframes you want to reposition by tracing a selection box. Click the Show Current Frame button to view the transformation results in the Camera view as you do them. Drag the keyframe selection up or down to reposition the sequence.